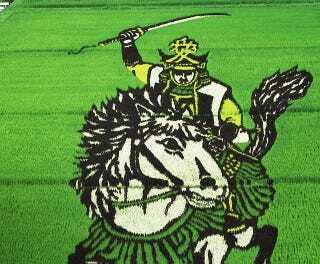 Inakadate village—located near Hirosaki city, Japan—is known for its unique landscape art created in paddy fields: Famers combine colorful rice strains along with the traditional green to make giant illustrations. Every year there's something new—here are the best of 2014. These amazing artworks started as a way of celebrating the discovery, in 1990, of strains of Inakadate in the rice that were 2,000-years-old.